Video analytics tools impact the bottom line - IoT predictions 2018: What will the next year of connectedness bring? One of the major benefits touted by the internet of things is the part it plays in accurately predicting when machines will break down or require maintenance. With the right forecasts, machines will only be fixed when needed -- and before a company's bottom line is affected. Rick Harlow, executive vice president and head of Americas at Flutura, believes that video analytics tools will have a key role to play in IoT and predictive maintenance in 2018 -- as well as a positive effect on organizations' bottom lines. "Over the course of 2017, sensors and video analytics tools have become smaller, smarter and less expensive -- all indicators of future adoption. With these changes, the ROI has become clearer and we will see an acceleration of these technologies in 2018. OEMs and customers will rapidly start to sensor brownfield equipment for vibration, video and acoustic anomalies, looking for signals that are leading to bearing failure, seal leaks, damaged electronics and other signals leading to failure. "In 2018, we will also see an increased use of video analytics for anomaly detection and remediation because companies want to move from time-based maintenance to condition-based maintenance. This will greatly impact bottom lines by reducing expensive damaged equipment failures and unnecessary trips, thus helping maintenance teams become more efficient by ensuring the right tech and right parts are right on time. "Sensors and video analytics tools can even be used to report the presence of rodents that chew wires and damage electronics. For example, rattlesnakes are being depopulated in oilfields in South Texas for safety reasons, causing the population of rodents to increase. The equipment that measures, monitors and enables gas production are being damaged by rodents, causing unplanned downtime." 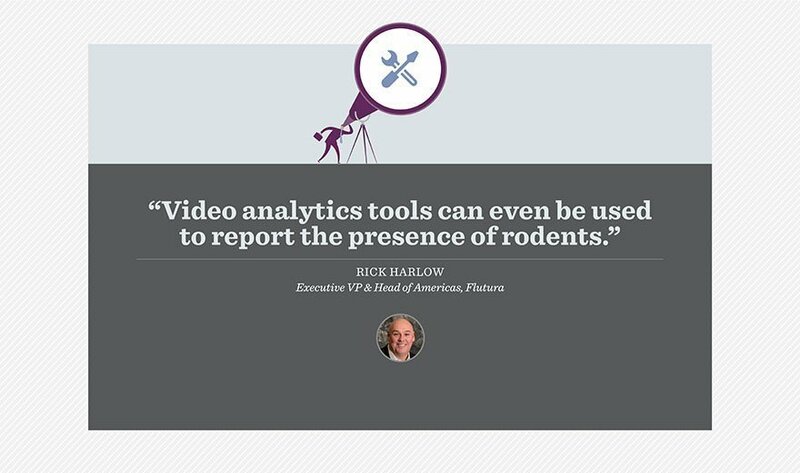 Where will video analytics tools fit into your enterprise?